It’s just over a week to go until the 5150 African Championships and you should be feeling strong and confident for the race. It is important though, to keep moving and to do some light training and short interval efforts. Swimming and cycling is generally not too hard on the body because they are not weight bearing sports, so 1-2hour bike sessions won't cause much fatigue. Include a couple of short swims this week, with some sprints like 25’s, 50’s or 100’s. Take a longer than normal rest interval to recover more between sets. Keep your running sessions short though as runs of up to an hour can still cause significant muscle fibre damage. Include a few short 20-30sec race pace strides. One specific taper plan is not going to work for everyone. Some people prefer taking a complete rest the day before the event. Others prefer resting 2 days before and doing some easy training in all 3 disciplines the day before. It will probably take you a while to figure out what works best for you, and this will only come over time with more experience at racing. It’s important though to get some rest in the week before your race to give yourself the best chance possible of a great day out. Sufficient sleep in the week before the race is also very important. It may be hard to get a decent night’s sleep in the night before the race, so be sure to sleep well the rest of the week. One night of bad sleep won’t harm you, but a week of bad sleeping will. Be sure to go over all your equipment a couple of days before the race. Check your bike - gears, tubes, tires. Make sure your goggles fit snugly, check your wetsuit, race belt, laces etc. Make sure everything is good to go. On race day, be sure to give yourself enough time to set up in transition, get to the race briefing and to warm up sufficiently. It’s also a good idea to walk the transitions - swim to bike exit and bike to run exit. Know where the mount/dismount line is and most importantly, know where your spot in transition is. Be prepared for a mad sprint in the 1st few hundred meters. If you are a beginner, rather try and start conservatively and build to an effort that you can maintain. It doesn’t help sprinting off in the beginning, only to blow 300m into the swim. A steady and controlled effort will ensure that you get through the swim smiling and strong onto the bike. On the bike leg, don’t kill yourself on every hill. This will drain all your energy, leaving you flat for the rest of the race. Try make up time and save power by pushing the flats and down-hills. Be sure to stay hydrated during the bike leg and this is also a good time to take in some nutrition. An energy gel every 45minutes throughout the race is recommended. Hopefully you will have included some brick sessions in your training and will be used to running straight off the bike. Your legs will feel like jelly initially so starting the run at an easy pace for a few minutes will give you time to get your running legs back. Once your legs have recovered from the ride, you can pick up the pace on the run to finish strong. Most importantly, enjoy the day and make the most of this exciting and rewarding experience. The Raynard Tissink Coaching Academy offers personalized training programs for all levels. 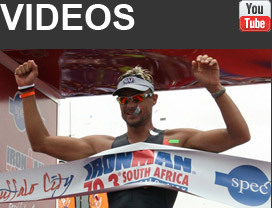 Contact us at info@raynardtissink.com to sign up for an IRONMAN 70.3 South Africa or IRONMAN South Africa program.